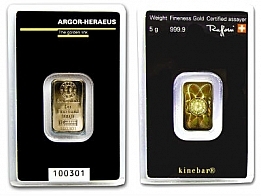 Argor Heraeus 1 Gram Kinebar Gold Bullion Bar 999.9 Fine. 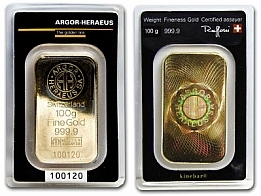 The Argor Heraeuse gold kinebar series is available in 1 gram, 2 gram, 5 gram, 10 gram, 20 gram and 1 ounce sizes. 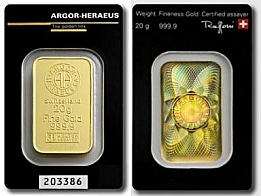 Argor Heraeus is one of Switzerland's most famous precious metals refineries. In addition to producing gold bars for investors, Argor Heraeus also produce investment bars in silver, platinum and palladium. However, the Kinebar series is only available in gold. 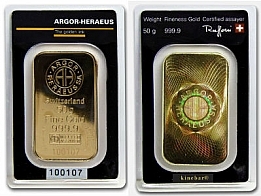 The Argor Heraeus Kinebar gold bars series is available up to 100 gram sized kinebars, however Argor Heraeus produce gold bars for investors up to 1 Kilogram.